MP2 Sandalwood Massage Oil is a specially prepared body massage oil containing cooling sandalwood that helps keep Pitta tendencies in balance. 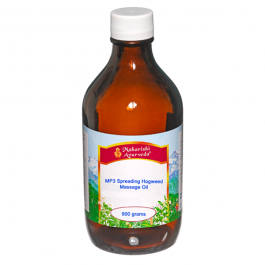 For use as recommended in Panchakarma treatment. Due to diet, environmental pollution, stress, fatigue and lifestyle choices, toxins build up in our cells and tissues. According to AyurVeda, these toxins, called Ama, are the basis of most disease. 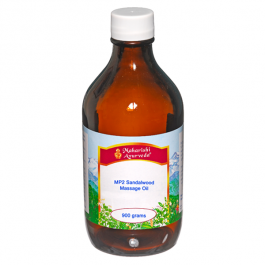 Panchakarma consists of a series of purification therapies designed to remove toxic Ama from our cells and tissues. In doing so, it supports the body’s self-healing mechanisms and helps promote good health. Panchakarma involves a series of carefully coordinated purification procedures, given in a specific sequence, to gently but effectively release and remove deep-seated toxins. Profound and long-lasting regeneration is the result. Your mind and body become more balanced, which naturally creates the basis for increased efficiency, vitality and zest for life. Ayurvedic massages to soften up the cells and tissues, to help them expel accumulated toxins. Heat treatments to open up the body channels and help move the toxic Ama into the circulatory system. 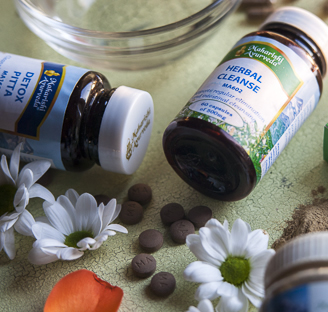 Nasal and intestinal cleansing treatments to fully expel toxins from the body, so they are not re-absorbed. Warm the oil to body temperature and massage into the whole body. Store in a cool, dry, dark place, tightly closed.